Don't even utter the words "instant batter mix". For any home cook the idea is blasphemous. 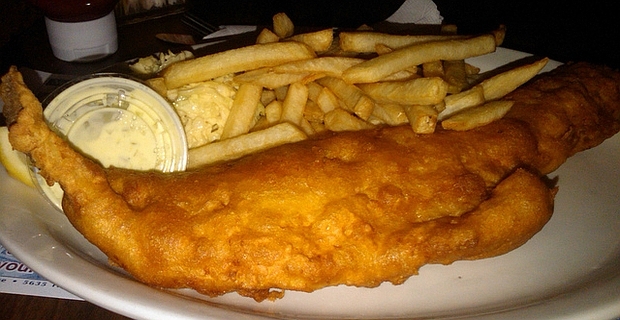 For perfect fish and chips at home, you have to make your own fish batter. Batter is essentially flour and a liquid, which can be water, milk or beer. Adding eggs is overdoing it, unless you really want to be eating fish encased in Yorkshire pudding or sponge cake. The secret of crispy batter is getting air into the mixture. There are different ways to accomplish this. Adding baking powder or yeast is one, but using a little light beer like pale ale or lager is preferable. Don't worry about alcohol content as that is lost in the cooking process. Using self-raising flour will produce the same results, especially if mixed with beer. If correctly cooked, the batter will bubble up and create little pockets of air, with delicious results. Fish-frying professionals offer one useful tip to amateurs: keep the batter very cold when you coat the fish. This can be achieved by using ice-cold liquid or chilling the mixture. When the cold batter hits hot fat, you get the complex reaction that produces that deliciously crispy finish. The correct cooking fat and the right temperature are the other key ingredients to getting perfect batter. With apologies to vegetarians, the fact that the best fish and chip shops still use beef dripping for their frying is testament to the fat's perfect interaction with batter. Otherwise, good quality groundnut oil or vegetable oil will suffice. Don't even think about olive oil. It won't reach a sufficient temperature to crisp your batter.